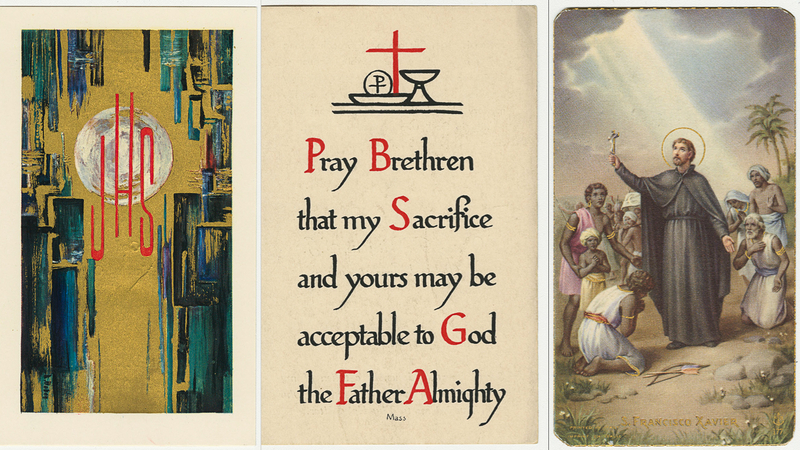 "Alphonse Fisher memorial holy card"
Funeral prayer card for Alphonse Fisher, 1886-1951. The front of the card contains a photograph of Father Fisher and biographical information. The back of the card contains a prayer for the repose of his soul and a prayer from St. Ignatius. This card was made by an unknown publisher. He was professor of philosophy and faculty director of athletics at Xavier University (Cincinnati, Ohio) as well as associate pastor of St. Xavier Church (Cincinnati, Ohio). (front) (back) Prayer. Grant, we beseech Thee, O Lord, that the soul of Thy servant, Alphonse, whom Thou hast honored in this life with the sacred functions of the Priesthood, may forever rejoice in the bliss of heaven. Through our Lord Jesus Christ, Thy Son, who liveth and reigneth world without end. Amen. Eternal rest grant unto him, O Lord. And let perpetual light shine upon him. May he rest in peace. Amen. "Take, O Lord, and receive all my liberty, my memory, my understanding, and whole will. Thou hast given me all that I am, and all that I possess. I surrender it all to Thee, that Thou mayest dispose of it according to Thy Will. Give me only Thy love and Thy grace; with these I will be rich enough, and will have no more to desire," -St. Ignatius. 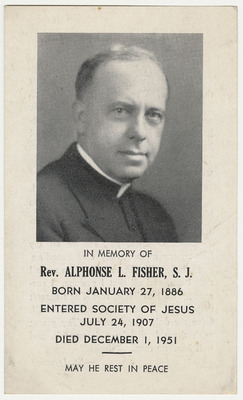 "Alphonse Fisher memorial holy card" (1951). Jesuit Memorial Holy Cards. 18.